They say that this is the start of something big for Irish angling. Michael and Dan have proven that you can catch big game fish just off the beach in Ireland, with a strong back and the proper equipment. 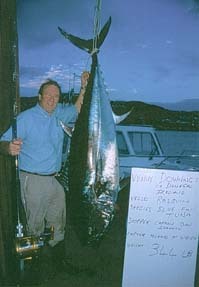 In 2001 and beyond, Donegal may well become one of the top spots in the world to battle giant bluefin. Here is a picture of Dan and I at Tranna Rossen beach, on Oct 15th 2000. A beautiful sandy beach, great for swimming, surfing and windsurfing. Its located on Atlantic drive, just to the East of Fishermans Village. My stay at Fishermans Village Lodge was perfect. Heathers' kitchen is brilliant, the smell of freshly prepared food fills the guest lodge day and night. The food was first class, we had 4 course home prepared meals every night, and frys ever morning. A "Fry" is a traditional Irish breakfast of bacon, sausage, blood pudding, and fried eggs. There is nothing like ending a home cooked Irish meal with a pint of Guinness and a Donegal turf fire with your feet up, completely relaxed. I returned from Co Donegal with more than great memories, at least an extra five pounds around the waist. The scenery just outside the door is incredible. The giant waves crashing on the rocks form the powerful heartbeat of Fishermans Village, and the clean fresh air was a welcome break from the smog of Los Angeles. For such a quiet area, there is actually a nightlife. The pubs are open late in Downings, until 1 or 2 in the morning! We tested those 'last call' times on a few occasions during the week. There are five pubs within ten minutes of Fishermans Village. There is even a local taxi service , just to keep things safe. I hope some of these picures caught a fraction of the areas beauty. It was an honor to play a small part in this adventure, as photographer and now as a story teller. Next year we will try for a 1000+ pound bluefin! Stay tuned for my Irish Adventure 2001. I would like to capture my next adventure on a different type of film. If I can put together the proper funding, expect either a documentary, or a full reality based movie. For more info on the Rosguill or Baile an Iascaire follow the link below. Our special thanks go to Sylvester Hiemstra of Eirinn Tackle.com for providing much of the gear used on our adventure. He carries a full line of fresh water and salt water fishing tackle and can be contacted by email sylvester@eirinntackle.com or follow the link below.